The S40 is designed and engineered according to three “pillars” that are the principles of its character - Vibrant Design and Style, Exhilarating to Drive and Class-Leading Safety. The newest member of Volvo’s S-range of sporting sedans continues to be offered in three versions: The value-leading S40 2.4i; the performance-oriented S40 T5 and the all-weather S40 T5 AWD. Enhancements for 2006 include a new, simplified Package and option structure, redesigned alloy wheels and improved cup holders. T5 models receive a “pushdown” function to engage reverse gear for the 6-speed manual transmission. 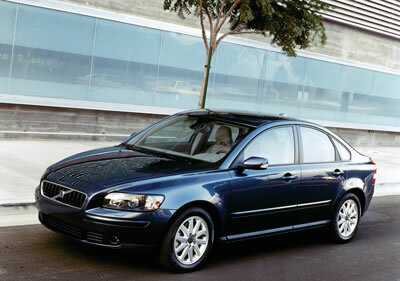 A choice of powertrains gives each S40 model a distinct character. A normally aspirated 5-cylinder engine that produces 168-horsepower motivates the S40. It can be mated to a 5-speed manual or 5-speed “Geartronic” automatic transmission. Increasing the fun factor in the T5 is a 218-horsepower light-pressure turbocharged engine. Those who crave an even more dynamic driving experience may equip the T5 with Volvo’s 6-speed close-ratio manual gearbox and electronically controlled all-wheel drive.